"On Tuesday, 17 November, in the South Hebron Hills of the West Bank, five Israeli settlers harassed a Palestinian family walking home, then beat and robbed two internationals who accompanied them. The two young parents and their three small children were returning from the nearby city of Yatta to their home village of Tuba. At 11 a.m. they encountered two members of Christian Peacemaker Teams (CPT) just south of the village of At-Tuwani. After the CPTers warned the Palestinians about the settlers seen earlier in the morning, the family chose a longer path toward Tuba, accompanied by the CPTers. As the group crossed Mashakha Hill, they saw four settler men on a ridge 50 meters above them. The settlers ran toward the Palestinians and began to circle them. A fifth settler, masked and hooded, appeared from the valley below. When the Palestinian man told them he was only trying to walk home, a settler shoved him. As the CPTers attempted to step between the Palestinians and settlers, the settlers pushed them to the ground, hit and kicked them, and stole their two video cameras. The settlers then walked to the illegal settlement outpost* of Havot Ma’on (Hill 833), where they disappeared among the trees 20 minutes later. The Palestinian family reached their home safely. For decades, residents of Tuba Village had a direct road to the village of At-Tuwani, and onward to the regional economic hub of Yatta. The Israeli settlement of Ma’on and its neighboring illegal outpost of Havat Ma’on were built directly on that road, blocking all Palestinian traffic and forcing villagers onto long dirt paths through the hills, taking as much as two hours. CPT has maintained a continuous full-time presence in At-Tuwani since 2005, supporting Palestinian freedom of movement under the threat of settler violence. CPT places trained volunteers in locations of violent conflict around the world at the invitation of local peacemakers. [*Note: According to the Geneva Conventions, the International Court of Justice in the Hague, and numerous United Nations resolutions, all Israeli settlements in the Occupied Palestinian Territories are illegal. 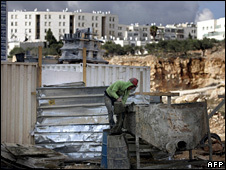 Most settlement outposts are considered illegal under Israeli law.]" Want to learn more about how you can oppose Israeli settlement expansion and acts of violent extremism committed by Israeli settlers? Click here to take action!